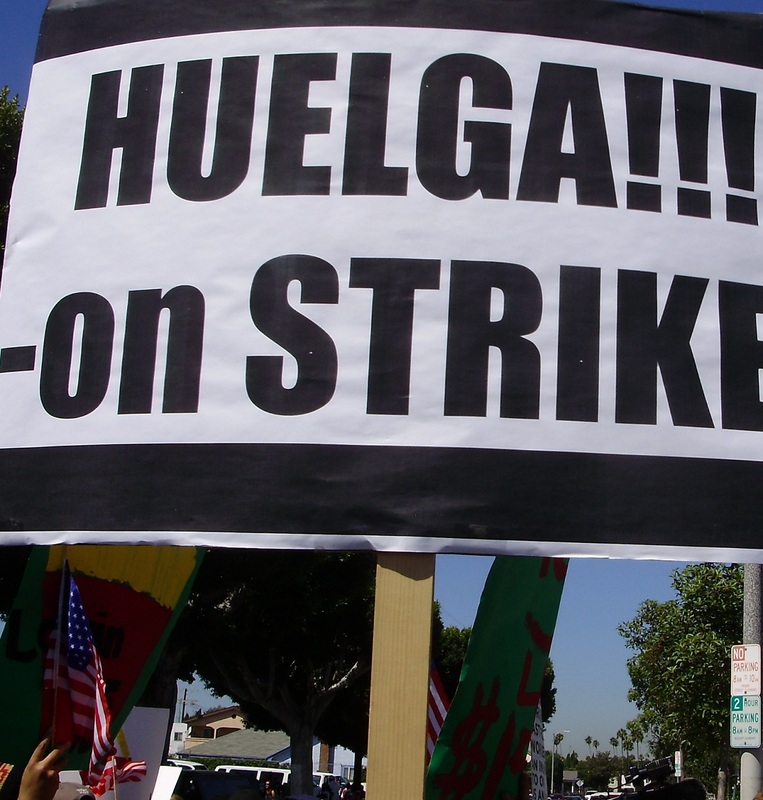 Fast food workers in Los Angeles County went out on a one-day strike on Thursday, August 29, as part of a national effort organized by the Service Employees International Union in more than 50 cities, to raise their pay to $15 an hour. In the late morning in Los Angeles near the corner of Western Ave. and Santa Monica Blvd., more than two hundred strikers and their supporters rallied near the corner of Western Ave. and Romaine Street. 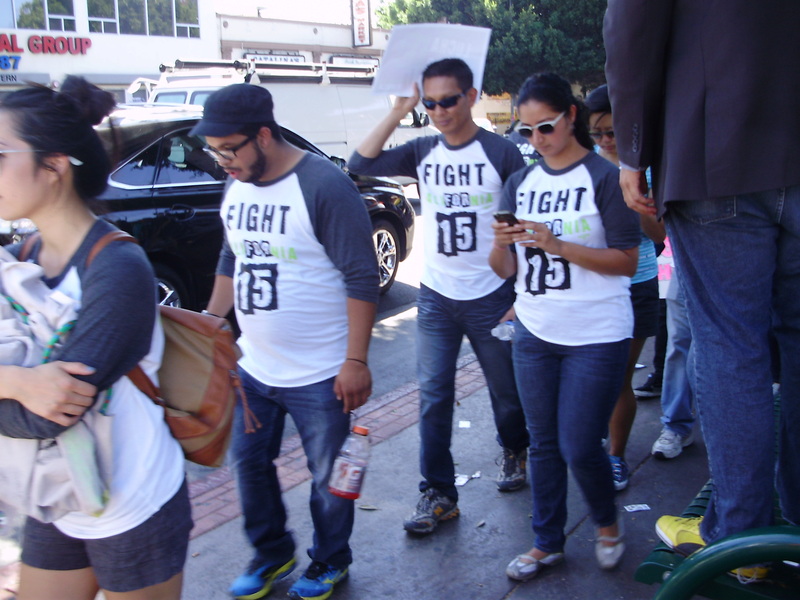 After the rally, the crowd marched on the sidewalk north on Western and then through the streets of Hollywood, sometimes bringing their protests inside some fast food restaurants on their route. 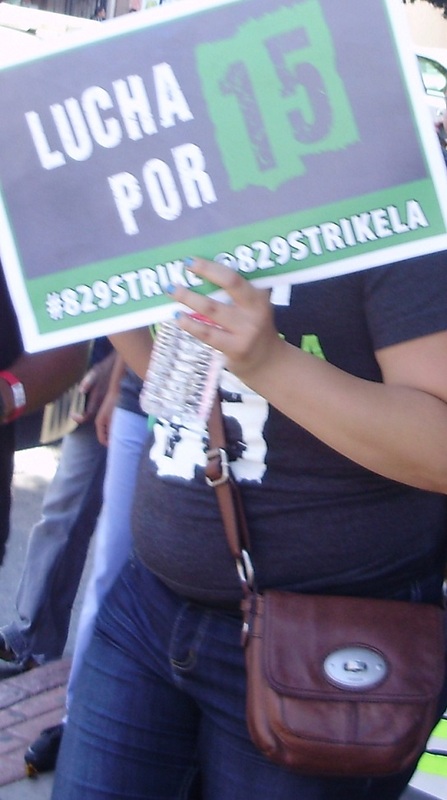 One striker from Long Beach was Arlene Alvarez. Alvarez, who has worked for Taco Bell for seven years, said she makes $8.44 with no health benefits and works between 35 and 40 hours each week. She said she was there because she wanted to raise the minimum wage. She said the medical insurance she has is Medi-Cal. 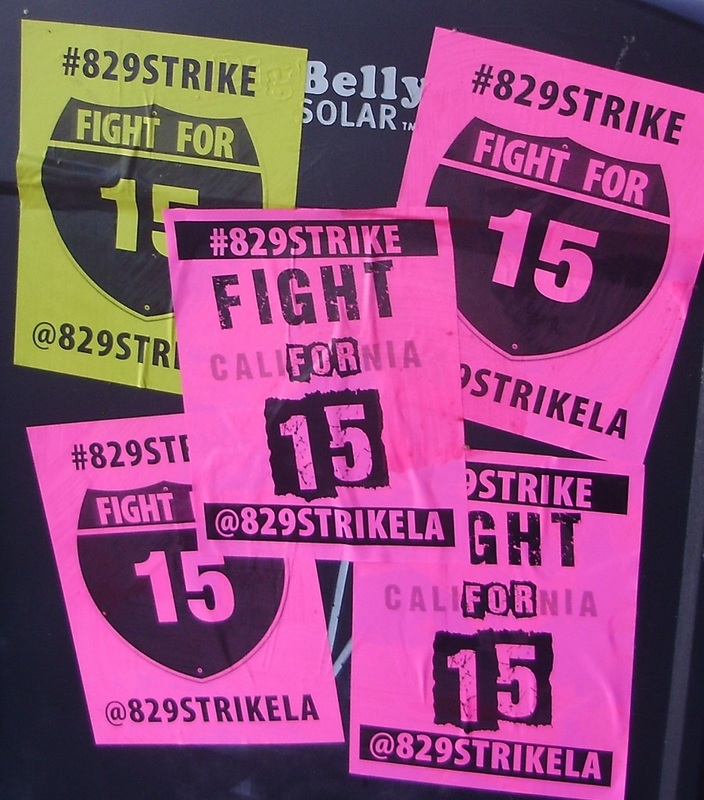 She did not believe her employer would retaliate against her for going out on strike. Alvarez brought her coworker Vincent Rolon to the rally and the march. Rolon, who is also a college student, said it was difficult making only $8 an hour and said after two weeks he brings home about $500 after taxes. Besides Rolon, Alvarez brought her 13-year-old sister, Gina Castillo and her 20-year-old boyfriend, German Ramirez, who is 24 and a union carpenter. 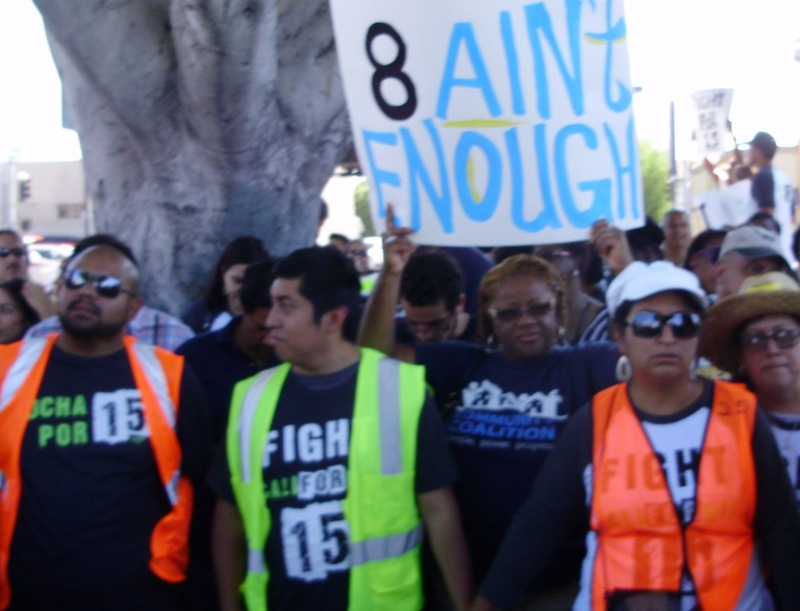 The marchers, mostly people of color, carried signs and wore tee shirts, which read, “Fight for 15.” One sign read, “8 ain’t enough.” Many signs were in Spanish. The Rev. William D. Smart, chairman of the Los Angeles Southern Christian Leadership Conference, Los Angeles, started and emceed the rally. 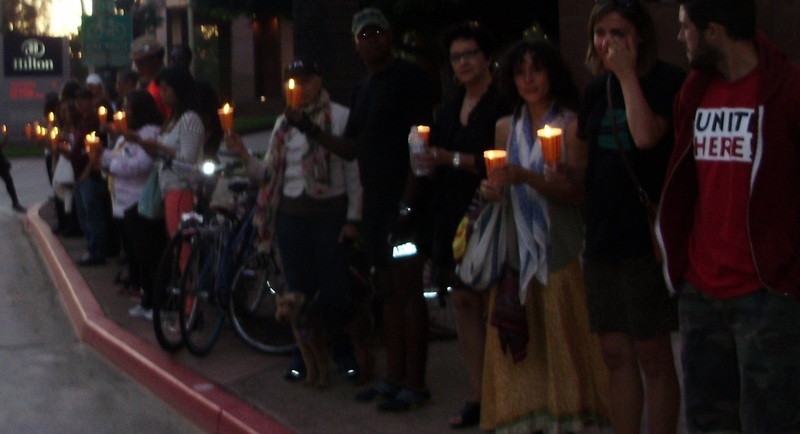 About 60 people, mostly supporters of the Long Beach Coalition for Good Jobs and a Healthy Community, held a candlelight vigil, on Saturday, Aug. 17 outside the Long Beach Hilton to protest the treatment of the hotel’s workers. Sprinkled among the crowd were some hotel workers and UNITE HERE Local 11 staff wearing red tee-shirts. 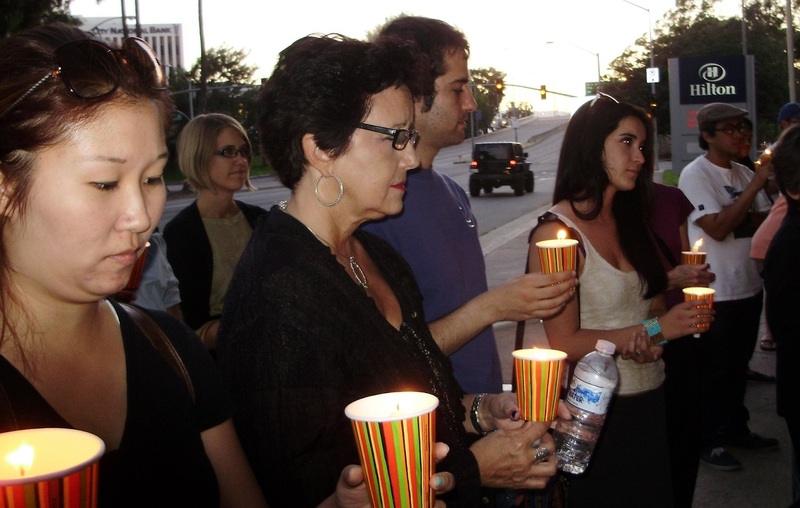 Near the end of the vigil, the crowd, holding their candles in multicolored paper cups, stood along the sidewalk facing the automobile traffic for the passing cars to see them. Before the vigil, the hotel management said that Brian Murphy, the hotel’s general manager, would be available no sooner than on Monday, Aug. 19 to provide a response.